China has denied reports that its military hacked into the computer network of the US Department of Defense in Washington. A foreign ministry official said the claims "reflected Cold War mentality". The Financial Times quoted US officials as saying the Chinese army made the attack, which crashed part of a system for the defence secretary's office. Last week China dismissed reports that its armed forces had infiltrated German government computer systems. The reports come as US President George W Bush prepared to meet his Chinese counterpart, Hu Jintao, at the Apec summit in Sydney, Australia. Chinese foreign ministry official Jiang Yu said Beijing "opposed and vigorously attacked" all attacks on the internet including hacking. "Some people are making wild accusations against China ... These are totally groundless and also reflect a Cold War mentality," she said. The Financial Times quoted a senior official as saying the Pentagon had pinpointed the origins of the attack and another as saying there was a "high level of confidence" that the People's Liberation Army was responsible. The Pentagon has declined to say who it thinks is behind the attack, which took place in June. Correspondents say the US and Chinese military regularly probe each other's networks, but the scale of disruption in the recent attack has raised concern. 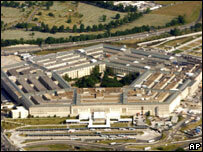 The Pentagon shut down the network for more than a week while attacks continued, the newspaper said. It quoted a source with knowledge of the attack as saying the data downloaded by the hacker was probably unclassified.